l3 is redundant, as it is determined by the given coordinates. Neat way to throw in a bit of advertising by the way. It's length 1 that is redundant. The point (x, y) could lie on either side of the line joining the given points, so a little extra information is needed to reduce the two possibilities to just one. Yes, that is the one I meant, obviously. I really should have taken typing more seriously. In any event, the point is that it is possible, but messy, and so needs only someone to spend the time. You should redraw the diagram . . . 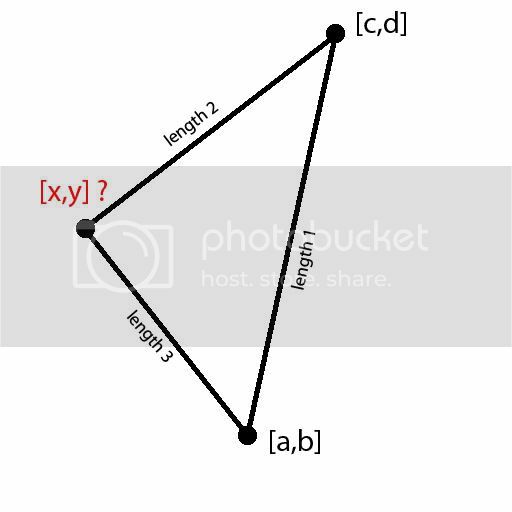 The point are collinear. That interpretation may be too literal. I interpreted "length 1" as meaning "variable 1", etc., so that the three lengths are given by three variables.